LOS ANGELES » The publicist for Kelsey Grammer says the actor has returned home from the hospital, four days after suffering a mild heart attack. Stan Rosenfield said today that the "Cheers" and "Frasier" star is resting comfortably at his home on the Big Island. He says Grammer thanks those who called and wrote expressing concern. Grammer was paddle-boating with his wife, Camilla, on Saturday when he experienced symptoms and was taken to a Kona hospital. Doctors determined the 53-year-old actor had suffered a heart attack that Rosenfield described as "mild." Rosenfield says he doesn't know if Grammer has a history of heart trouble. King Kamehameha the Great's birth is being celebrated this week with the popular annual parade, lei draping and festival. The festivities begin tomorrow at 3:30 p.m. with a performance by the Royal Hawaiian Band followed by a lei draping ceremony at 4 p.m. for the King Kamehameha statue at the Hawaii Supreme Court building at King and Richard streets. The popular King Kamehameha Day Parade, the 92nd to be held annually, begins at 9:30 a.m. Saturday. About 5,000 marchers, 50 vehicles, five bands, eight floats and 80 horse riders representing various islands are expected to participate. The parade, with its colorful floral floats, marching bands and riders, travels from the King Kamehameha statue in front of the Hawaii Supreme Court Building (Aliiolani Hale) across from Iolani Palace to Punchbowl Street, onto Ala Moana Boulevard, merging into Kalakaua Avenue, ending at Queen Kapiolani Park. "It's the biggest parade in the state, the only one that goes for four miles," said Mona Wood, spokeswoman for the King Kamehameha Celebration Commission. The parade is expected to end at about 1:30 p.m. when the last float from King Street reaches Waikiki. For those who cannot make it in person, the parade will be televised live on KHON2 from 9:30 to 11 a.m. — for the first time in many years. At Kapiolani Park, where the parade ends, there is also a Hoolaulea festival from 9 a.m. to 3 p.m. with entertainment, food booths and traditional Hawaiian arts and crafts. State officials have started screening international airline passengers for flu-like illnesses as part of a program that they hope will become a model for airports around the nation. The one-year pilot program, the first of its kind in the country, adds a voluntary checkpoint at Honolulu Airport to detect flu-like illness among incoming international passengers. "It makes sense for the U.S. to investigate this strategy, given the very real concerns for a potential influenza pandemic," said Chiyome Fukino, health director. A Hawaiian Airlines flight from Sydney was the first to fall under the pilot project yesterday. "It went amazingly well," said Sarah Park, deputy chief of the Health Department's Disease Outbreak Control Division. "We were able to screen 149 passengers ... in a little over 10 minutes." The state Department of Health will examine about one flight a week but hopes to stretch that to four flights per week after the program moves into full swing, Park said. In the program, passengers voluntarily fill out a questionnaire that asks their recent travel itinerary and illness history. Nurses at a checkpoint review the questionnaires. Travelers who feel feverish or are detected with fever during the screening process enter the airport's illness surveillance procedure, which includes a voluntary throat swab. Information is kept confidential. The University of Hawaii's "Termite Project: Educate to Eradicate" will hold three public information seminars this summer to help homeowners learn how to prevent and control termites. » June 17, Mililani High School; to register, call 622-1634. » June 25, Moanalua High School; to register, call 837-8466. » July 23, Windward Community College; to register, call 235-7433. UH termite expert Julian Yates will discuss these wood-eating insects and participants will be able to ask questions regarding termites and their homes. The UH Termite Project connects scientists with the community in hopes of controlling termite damage to homes and buildings. Hawaii spends more than $100 million a year to control and repair termite damage. A man was seriously injured yesterday after being thrown 25 feet down a slope when his new motorcycle struck a metal guardrail outside the Wilson Tunnel. At 11:26 a.m. the motorcyclist was traveling Kaneohe-bound on Likelike Highway when he lost control and struck the guardrail. The motorcyclist was thrown. Firefighters rappelled about 25 feet below the guardrail to bring him up the steep embankment. The motorcyclist, in his early 20s, was wearing a helmet and was conscious and alert after the crash, said Capt. Terry Seelig, spokesman of the Honolulu Fire Department. Paramedics transported him in serious condition to the Queen's Medical Center. Seelig said the man owned the brand-new black-colored motorcycle for two days before the accident. 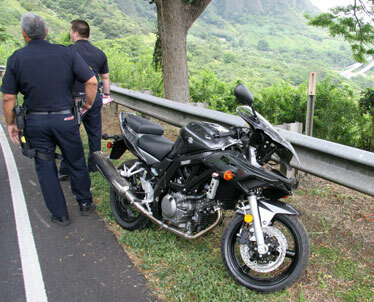 A damaged motorcycle marks the spot where a biker struck a guardrail and flew 25 feet down a Likelike Highway embankment yesterday. The man was hospitalized in serious condition. Big Island police are looking for the person or people who vandalized playground equipment at the Hilo YMCA. Police said paint was poured on playground set, which was then set on fire between. The crime occurred between 6 p.m. Tuesday and 6:30 a.m. yesterday. Anyone with information should call Officer Matthew Kaaihue at 961-2213, the nonemergency line at 935-3311 or CrimeStoppers at 961-8300 in Hilo or 329-8181 in Kona. One adult and two children escaped a fire Tuesday that destroyed their South Kona home, according to the Hawaii County Fire Department. The fire was reported at 12:36 p.m. Tuesday at 89-0916 Hoopuloa Farm Road in Honomalino. Fire officials said the 20-by-30-foot home had collapsed by the time the first units arrived on scene nearly 30 minutes later. The occupants had gotten themselves out safely, officials said. Damage was estimated at $25,000. The cause of the fire is under investigation. Big Island police are looking for the person or persons who vandalized playground equipment at the Hilo YMCA. Police said a playground set first had paint poured over it, then was set on fire between 6 p.m. Tuesday and 6:30 a.m. yesterday. Police are asking for anyone with information on this case to call Officer Matthew Kaaihue at 961-2213 or the nonemergency line at 935-3311. Those who wish to remain anonymous may call CrimeStoppers at 961-8300 in Hilo or 329-8181 in Kona. Police arrested an 18-year-old Kalihi man who allegedly kidnapped and sexually assaulted a 13-year-old girl at a Kalihi apartment complex. Police said the girl reported being held against her will and sexually assaulted by the man between 2:50 and 4 p.m. May 30, and sexually assaulted between 3 and 4 p.m. Monday. Police arrested the man at 6:30 p.m. Monday at a Middle Street address for investigation of kidnapping, two counts of third-degree sexual assault and harassment. He was released pending further investigation. An alert neighbor helped catch a suspected thief early today. Police said that at about 3:27 a.m., a 46-year-old woman was in her living room in Manoa when she saw the suspect walking on the road. She said she saw the man break into another woman's vehicle, take property, then leave in his own vehicle. The witness called police, who stopped the suspect on Oahu Avenue at Kaala Street. The man, 28, was arrested on suspicion of unauthorized entry into a motor vehicle. A man in his 50s was in critical condition yesterday after he was hit while crossing the street at Dillingham Boulevard and Kaaahi Street, officials said. The accident occurred at about 9 p.m. The man was dragged about 20 feet after he was struck, said Bryan Cheplic, spokesman for the Honolulu Emergency Services Department. The man was taken in critical condition to the Queen's Medical Center. Police arrested a 16-year-old boy who allegedly slapped his teacher at the Hawaii Youth Correctional Facility in Kailua. Police said that at about 10 a.m. Tuesday, a 52-year-old substitute teacher was tutoring juvenile inmates at the youth prison when he was slapped by the suspect. The teacher suffered minor injuries, police said. The teenager was arrested on suspicion of second-degree assault. At 11:26 a.m., the motorcyclist was Kaneohe-bound on Likelike Highway when he lost control, struck the guardrail and was thrown off the bike. Firefighters rappelled about 25 feet below the guardrail to bring him up. The motorcyclist, in his early 20s, was wearing a helmet and was conscious and alert after the crash, said Capt. Terry Seelig, spokesman of the Honolulu Fire Department. The victim, who got the motorcycle two days before the crash, was taken to the Queen's Medical Center in serious condition. Police arrested a 54-year-old woman who allegedly tried to cash a stolen check. At about 1:30 p.m. yesterday, the woman entered a Waianae business wanting to cash a personal check belonging to a 26-year-old man. Police said the cashier became suspicious and called the phone number listed on the check. It was discovered that the check was reported stolen in an auto theft case. The cashier stalled the suspect until police arrived. The woman was arrested on suspicion of second-degree forgery and unauthorized possession of confidential personal information. Police arrested a 33-year-old man for allegedly stealing his brother's car, driving drunk and fleeing the scene of an accident. At about 8 p.m. Monday, a 25-year-old man woke up and noticed his car was missing. Police said that two hours later the victim's brother was driving the missing car in Waipahu when he hit a parked vehicle and fled the scene. Police responded later to an argument in Ewa Beach, where the brothers were arguing about the car. The suspect allegedly admitted to being involved in the accident. Police arrested the man on suspicion of driving under the influence and fleeing the scene of an accident, as well as for two outstanding warrants. He also was initially arrested for investigation of auto theft, but the suspect's brother withdrew the complaint.